For weeks I have been focusing on 1 Corinthians 13:13 “And now these three remain: faith, hope and love. But the greatest of these is love.” I have wondered… how do we show love? If it is the most important of the three, then how do we make sure we show love?!? I had a wise gentleman in my office and he was kindly quizzing me about how our ministry shares the Truth, and teach children about the Bible. That’s it….that is how you show love…you show the love of Jesus! So Building All Children is having a Children’s Bible Drive for the month of February! Tomorrow is Valentine’s Day…we believe in showing love all year long not just one day a year! So, we are celebrating the entire month and we are so excited! We have several local churches helping us with this mission. 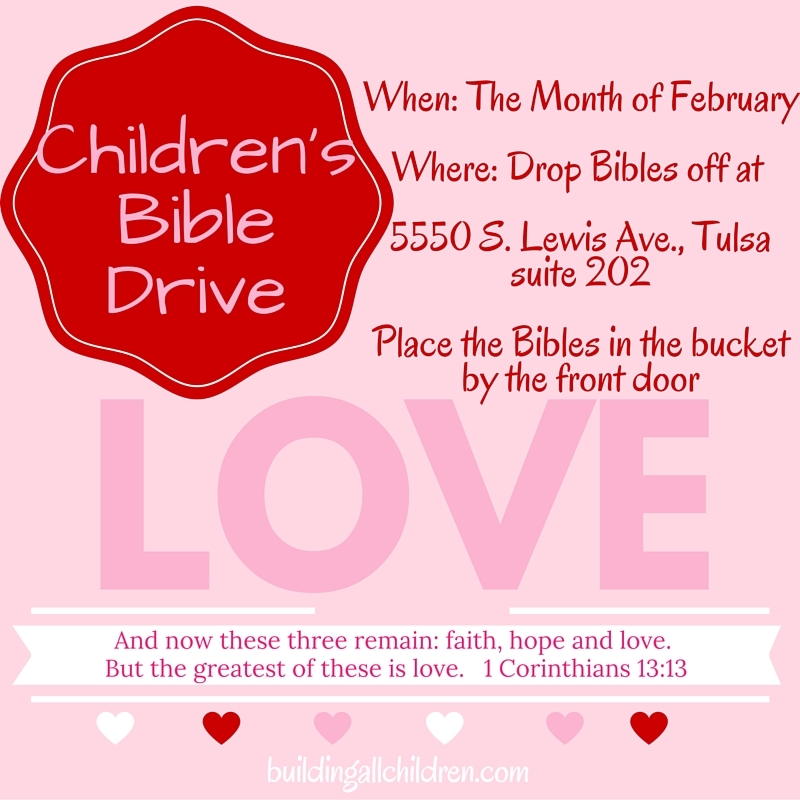 Our goal is to collect as many Children’s Bibles as possible in the month of February. We will have a bucket in front of our office where you can place the Bibles (5550 S. Lewis Ave. Tulsa, OK 74170) or let us know if you have some and we will pick them up. We are hoping to collect enough Children’s Bibles for every child that we help through our program. Again, please know that we appreciate all and any support! This is a great activity to get your entire family involved!